NORWALK, Ohio -- The International Hot Rod Association announced today that the IHRA Nitro Jam Drag Racing Series will feature a number of enhancements for the 2014 racing season including an exciting 11-race series schedule, the addition of a national points fund, the return of traditional drag racing, a new Fan Zone pit experience and more all to be implemented for the 2014 North American Tour. The expanded schedule, which will return each event to the designation of Nationals, will include traditional favorites such as the San Antonio Nationals at San Antonio Raceway (March 28-29), the Palm Beach Nationals at Palm Beach International Raceway (May 2-3) and the MOPAR Rocky Mountain Nationals at Castrol Raceway (July 4-6), plus a return to Rockingham Dragway (May 16-17) for the Spring Nationals and Maryland International Raceway for the Northeast Nationals (June 13-14). 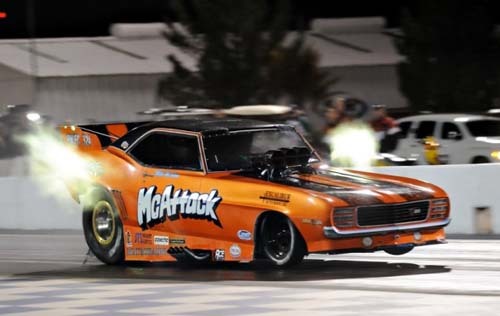 All events in 2014 will feature four core classes of competition - Nitro Funny Car, Nitro Harley, Nitro Altered and Jet Dragster, plus additional sportsman classes at each event. The series will also include an expanded Fan Zone pit experience for fans including interactive exhibits, driver Q&A's, racing simulators and the addition of the world famous "Hollywood Cars of the Stars" collection from the Miami Auto Museum that will travel the IHRA circuit throughout the year. "This is certainly an exciting time to be a part of the International Hot Rod Association. Over the past three years we have seen the series grow like never before and now we have an opportunity to take what we have learned and combine it with traditional formats to form a hybrid series that speaks to all motorsports fans," said Aaron Polburn, President of IHRA Motorsports. "We are so excited combine a great racing product with a pit experience that will be worth the price of admission by itself. The 'Hollywood Cars of Stars' collection, plus the incredible Larsen Motorsports group, will make for an event to itself. "All of this combined with an expanded schedule, which includes some exciting new stops, makes for one of the most exciting IHRA seasons in some time." 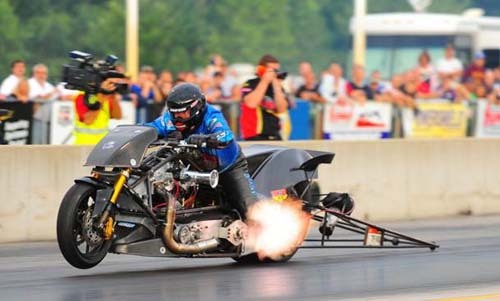 Also new in 2014, the Nitro Jam Drag Racing Series events will feature a four-car field of Jet Dragsters competing in elimination-style competition for the IHRA jet championship. Each event on the tour will feature the "Fastest Girls in Racing" as the Larsen Motorsports jet team will join the IHRA exclusively for the 2014 season. 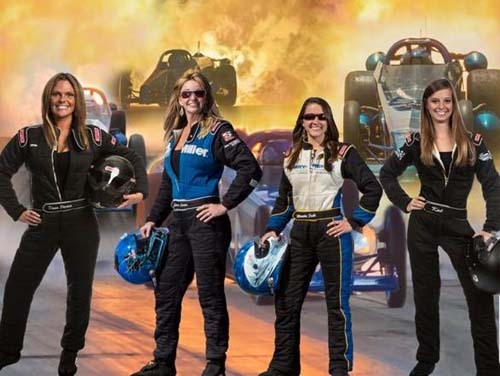 The four-car team, made up of female racers Elaine Larsen, Marisha Falk, Dawn Perdue and Kat Moller, will showcase themed dragsters and incredible 300 mph jet-powered competition. Larsen Motorsports will also be hosting the newly expanded Fan Zone pit experience that will feature driver and fan interaction, activities for fans and one of the most exciting additions ever to the series - the world-famous "Hollywood Cars of the Stars" from the Dezer Collection at the Miami Auto Museum. At all IHRA events in 2014, the Dezer Collection on Tour will hit the road with the "Hollywood Cars of the Stars" featuring some of the most iconic cars in the world including vehicles from such hit shows and movies as Dukes of Hazzard, Beverly Hillbillies, Grease, Ghostbusters, Harry Potter, The Munsters, Chitty Chitty Bang Bang, Back to the Future, James Bond, Batman and more. Each event will feature different cars from the collection. In addition to its professional lineup, IHRA will retain its status as the home for sportsman racing with sportsman racing to be included at every Nitro Jam event in 2014. And to add to the excitement, Summit Racing Equipment recently announced that it would return as sponsor of IHRA's premier sportsman programs including the incredibly popular Summit Tournament of Champions, Summit SuperSeries and Summit Pro-Am Tour. "We are thrilled to bring a whole new experience to drag racing fans and fans of the International Hot Rod Association in 2014," said Jason Rittenberry, Chief Executive Officer of IRG Sports + Entertainment, the parent company for IHRA. "Our goal is to bring together the best of both worlds, combining exciting drag racing action with an entertainment element that is unmatched in the motorsports industry. By bringing together these classes unique to the IHRA, along with elements such as the 'Hollywood Cars of the Stars', the new Fan Zone experience, the Larsen Motorsports jet team and more, we look to create an event that is unlike any other in drag racing. We are creating a motorsport experience for the entire family."